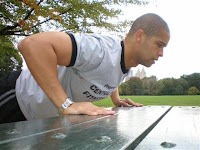 Central Park Fitness: Everything you wanted to know about bootcamp! Everything you wanted to know about bootcamp! A lot of you have been asking for more information about "Starving Artist Bootcamp" so todays post is just a little bit of background info and FAQ's about bootcamp. The concept for my bootcamp came about when I was working as a bouncer in various bars around NYC. Almost every waitress was an aspiring actress, singer, dancer. As you can imagine it's a competitive business and since they all knew I worked as a trainer by day, they would always come to me for advice. Being that they were "starving artists", going to auditions by day and waiting tables by night, I knew they couldn't afford my regular 1-1 personal training but if I developed a group type workout, they could all get fit for a fraction of the cost. The next aspect of the bootcamp was that it wasn't enough to make these women look good; every actress, singer, model, etc looks good. They had to look GREAT! The workout had to be designed to shed fat and sculpt lean and tone muscles and to do it quickly. The rest as they say, is history! A. Yes! It's hard because it has to be. It's a results oriented class. See my previous blog post regarding the Overload Principle. You must give the body more than what it is accustomed to in order to make it adapt. Q. Just how hard is it? Do I have to get in shape to come to bootcamp? A. Quite frankly, it is hard for EVERYONE. We have people that have been coming to bootcamp for 3+ years and it's still hard for them! Reason being is that you will be pushed according to your existing fitness level. If you run a 12 minute mile, you'll be pushed to run an 11 minute mile. If you run an 8 minute mile, you will be pushed to run a 7 minute mile. I don't expect the same ABILITY from everyone, I do expect the same EFFORT from everyone! Q. Is there a lot of running? A. The amounts of running vary from class to class. If you are a "runner" looking for a "running class" this isn't for you. If you are a runner looking to cross train, then this is for you. Generally speaking, we will never be running more than one full lap around the reservoir at any one time. Some days there may be very little jogging but lots of sprints. Days where the lawns in Central Park are excessively wet usually result in us doing "True Bootcamp Style" where we run for a couple of minutes, stop and do exercises, run some more, etc. 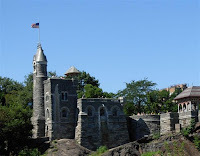 The Central Park Conservancy won't allow us on the lawns under wet conditions (red flags on the lawn). Q. I have a few nagging injuries, is bootcamp safe for me? A. 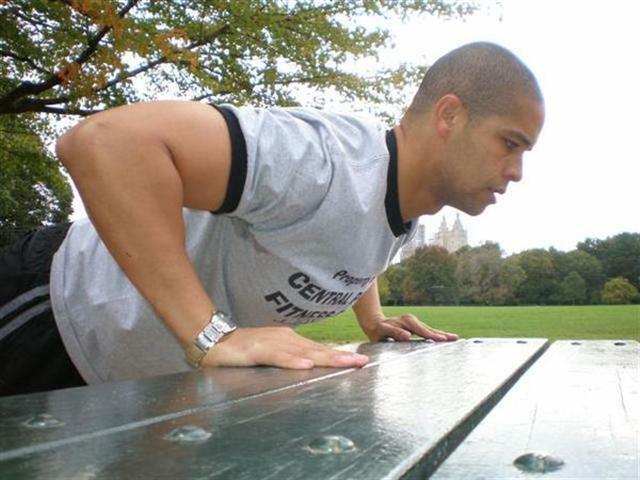 One of Central Park Fitness mottos is "Work Smarter, Not Harder" Bootcamp is designed to improve your body's functional capabilities as well as your overall fitness. Injury prevention is paramount. Q. I'm not a "starving artist", I'm a banker. Can I participate? A. Of course! Starving Artist Bootcamp is for anyone that wants Hollywood fitness at an off-Broadway price! A. Your existing fitness level and regularity of attendance as well as attention to your nutrition will determine your exact results. If you have a significant weight loss goal, you will be on the fast track to achieving it. If you are simply trying to shed the last couple of stubborn pounds, you will do it. If you are happy with your weight but looking to get quicker, faster and stronger. You will do it. Most importantly, if you are just looking to put the FUN back in your workouts, Bootcamp is for you! Q. Is it only for women? A. No, Bootcamp is for men and women. Guys, you won't be doing 1980's styled aerobics moves and ladies don't worry, you won't be doing brute squad barbaric lifting movements. Q. I am seriously obese (50+ lbs overweight), can I do bootcamp? A. The short answer is yes, just about anybody is capable of doing bootcamp. All of the exercises in bootcamp can and will be modified for the skill levels of each individual. With that said, if you have any major medical or physical conditions, we should discuss them and you may be required to provide clearance from your doctor prior to participation. Q. The fitness classes at my gym are all so cliquey and the people so catty, I want to try classes but I'm afraid to rock the boat. A. NYC is a melting pot and I'm proud to say that so is bootcamp! We have people from all over the country from all sorts of backgrounds; bankers, fashion professionals, actresses, waitresses, moms. Everyone is friendly and supportive of one another and comes together over their love and desire to live a healthy life! Q. Is there a place to store my valuables? A. Unfortunately, no. If you absolutely must bring a bag with you, make sure you bring a backpack, not a duffel bag so that in the event we have to run around the park, you can wear it on your back. (you will get an extra good workout that day!) Otherwise, try to carry a small hip pouch or wristlet with your phone, keys, metrocard, etc. Most days we setup in an area of the park around the Great Lawn or the Pinetum and stay in that area. On days where we may be running a lap of the reservoir, the instructor stays behind to look after everyones small valuables. Q. Are there bathrooms in the park. A. There are some bathrooms in the park near the Delacorte Theater, however, we aren't typically near the bathrooms so try to plan accordingly. Also, there are some water fountains in the park, but we recommend bringing your own bottle because the fountains aren't always in close proximity. Ready to take the next step to have the body of your dreams? Sign up today! First time participants can try it out for just $10! I wish I lived closer so I could participate. I think it sounds like a great group and I would love to be a part of it. DAMN YOU CT. From my experience workouts are best with a group for the company as well as the encouragement!! IF you ever come into the city, give me a holler! Also, check around your area of CT, there may very well be some bootcamp or Crossfit offerings there! I lament that I don't live in the burbs, it would be so much easier to set up a really really kickass bootcamp in the burbs because i could have a trunkful of equipment and drive right up to a location with it instead of schlepping limited equipment in a back back or on my bike's rack! "What are you doing? Trying to be HEALTHY?"